IRS Form 1099-QA or the "Distributions From Able Accounts" is a form issued by the U.S. Department of the Treasury - Internal Revenue Service. A PDF of the latest IRS Form 1099-QA can be downloaded below or found on the U.S. Department of the Treasury - Internal Revenue Service Forms and Publications website. included in income. Report taxable amounts as “Other income” on Form 1040. 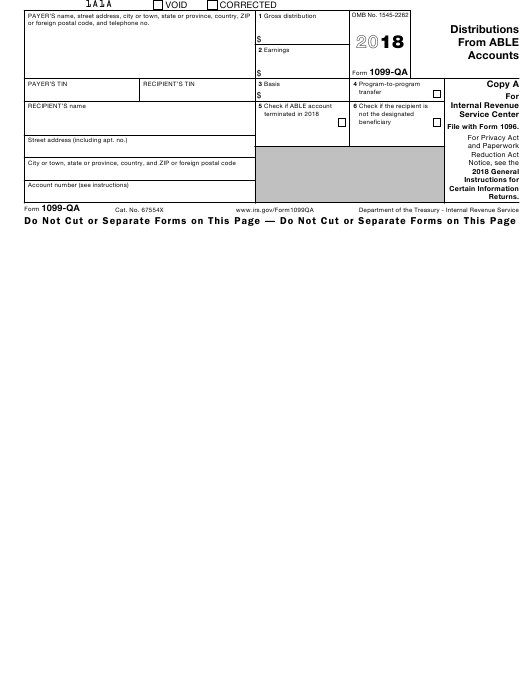 Also see Form 5329 and its separate instructions. Box 3. Shows your basis in the gross distribution reported in box 1.
this ABLE account to another ABLE account. Box 5. This box is checked if the ABLE account was terminated in 2018.
distribution also includes a return of excess contributions plus earnings. Box 2. Shows the earnings part of the gross distribution shown in box 1. • the 2018 Instructions for Form 1099-QA.